February | 2011 | Crappy Kitchen - Good Dinners! our first grilled burger of the year! Yesterday in the late afternoon the weather turned sunny and balmy. The kids were outside and I had the urge to be outside too. The last couple of weeks I have noticed birds chirping and it has me salivating for Spring! I donned my top-boots and took a stroll around the backyard – which didn’t take long because it is puny and looks a little like my kitchen – crappy! 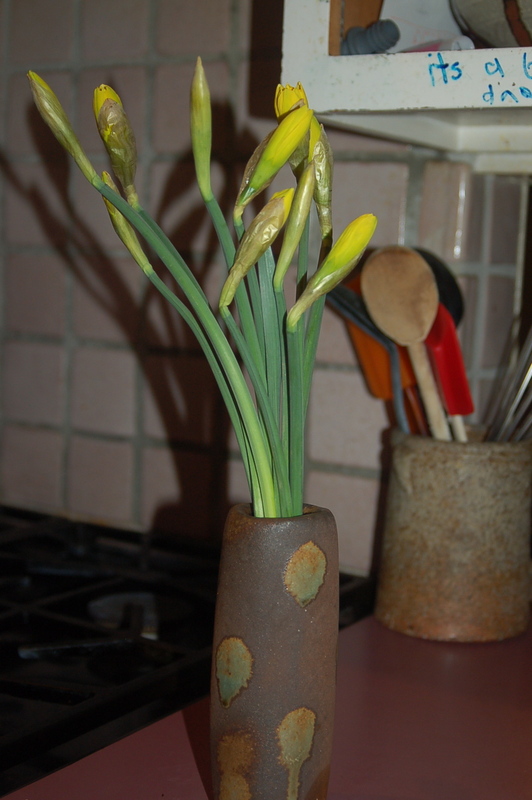 I am in the process of changing that and this week I plan to add a little gardening section to my blog. I am no gardener but I’m going to give it a try. Last year my brother-in-law gave us his modest little Weber Grill as he treated himself to a fancy gas grill! I took it as an incentive to get the yard together. Perhaps if I made it feel more like a kitchen I would be spurred on? More about that in my gardening rant……. Anyway, while cleaning up the winter debris I started thinking about dinner. It was so nice out I didn’t want to go inside which lead me to the grilling for dinner plan. Off I went to the shop for charcoal and minced beef and we all hung outside until the burgers were done. It was really fun. There is nothing better than being outside and playing with fire! I am looking forward to becoming better at the whole grilling thing – Roll on Spring! You will need: 2 lbs minced beef (or combo of beef and lamb? 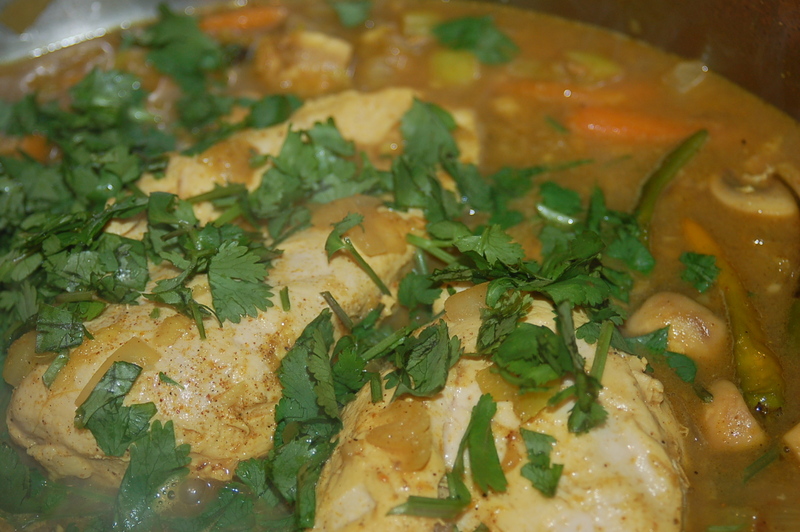 ), 2 medium sweet onions, 2 eggs, 1 tsp salt, 1 tsp freshly ground black pepper, 2 tsp mild curry powder, 2 tbs olive oil. For Garnishes I had: strong cheddar, sliced Haas avocado, red-leaf lettuce, grape tomatoes or 2 medium tomatoes, strong mustard (I used Coleman’s) 6 burger buns or white crusty bread. Fire up the grill! 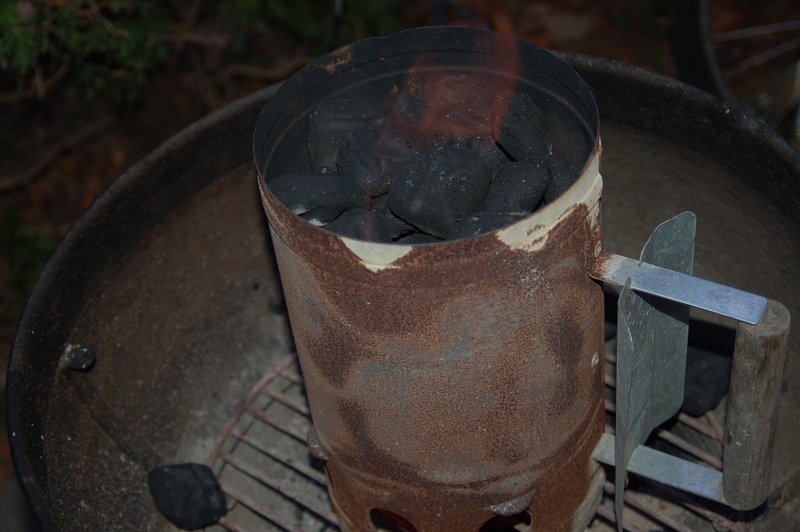 I have a very simple hand-me-down Weber grill with a handy fire starter bucket. I’m going to presume that anyone of you who has a grill knows how to use it? If it is like mine and needs time to light and then time to get hot, do that first. 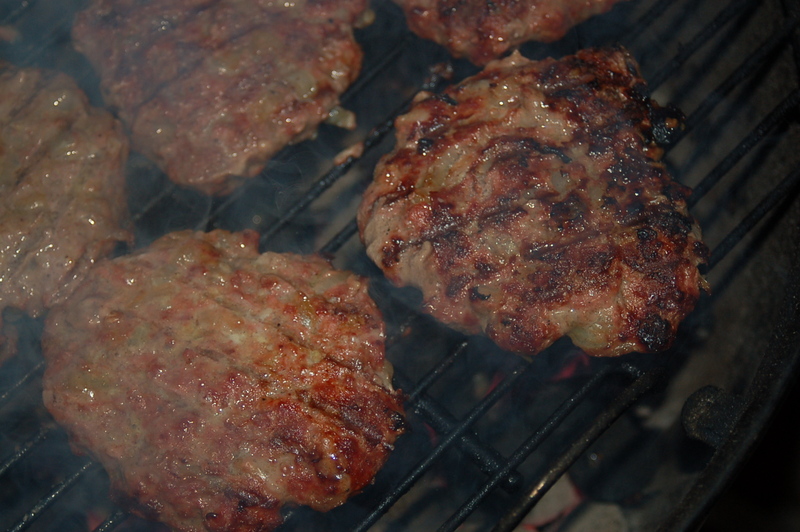 If it is gas then make sure it is hot after you have all your prep done and formed the burgers. Dice onions and cook over low heat (lid on) with oil until very sweet and soft – about 20 to 25 minutes (you can do this ahead and store in the fridge until ready to put in burger mix). While onions are cooking get the rest of your prep done! Crack the eggs into a big mixing bowl and whisk a little with a fork. 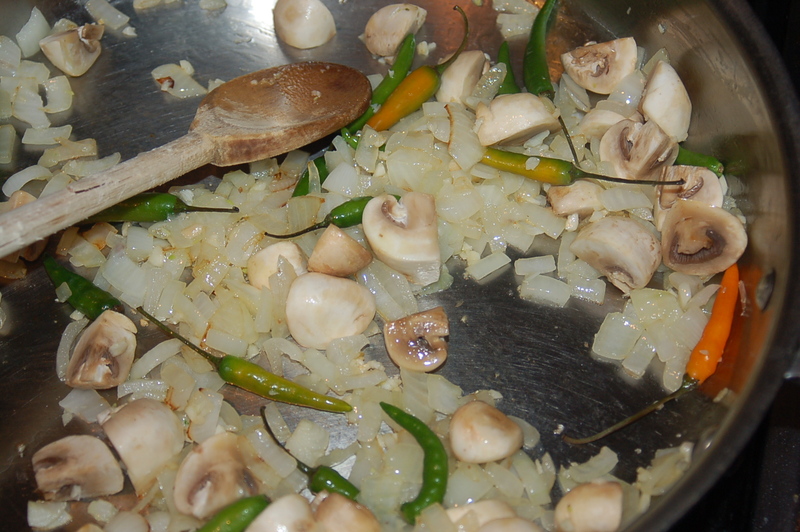 Add meat and sprinkle the seasonings on top (salt, pepper, curry powder) and set aside until onions are ready. the onions make all the difference..
Wash and dry lettuce, slice cheese, slice avocado, slice tomatoes. When onions are ready tip them into the meat and seasoning mixture. This is the fun part: mix everything together throughly with your hands until everything is evenly distributed. Form into big patties. 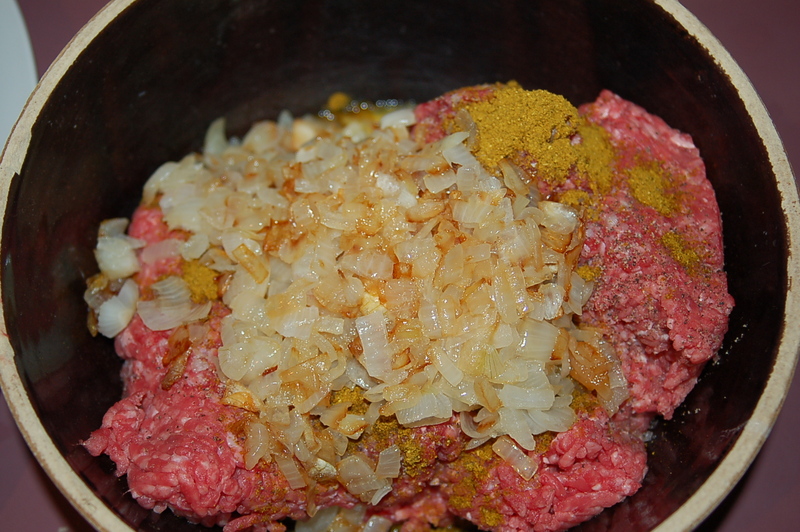 If you need some guidance tip the mixture onto a big surface and roll into a rough sausage shape and measure for six burgers. My burgers were about 4 1/2″ in diameter, but you can always make them fatter or measure for 8 burgers? Keep an eye on your burgers while they are cooking! Drizzle each burger with some olive oil. Cook on the grill to your preference. We (to the disgust of real burger lovers) like our burgers on the not so pink side so I cooked them for about 4 minutes per side, give or take. 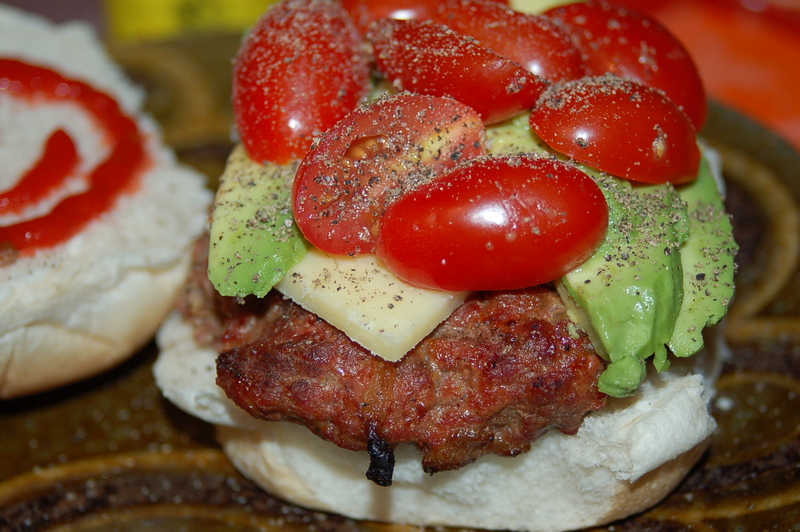 Warm buns or bread on grill and then build your burger with whatever toppings you like! 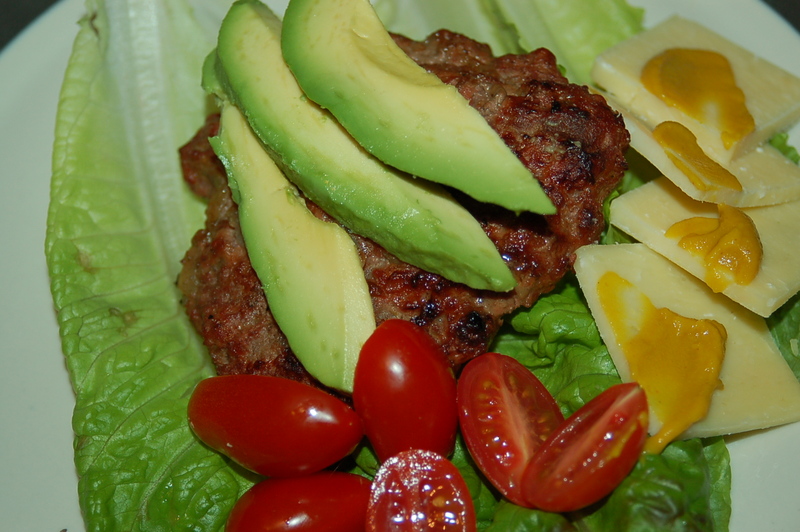 I had my burger like this - I didn't want the bun so I made a sort of burger salad - a great way to eat lighter! Alternatively you could do this: if you don’t have a grill or don’t want to grill, just simple fry the burgers on a pan on medium heat. The oil you rub on the burger before cooking is all you need – no need to put oil in the pan. The buns can be warmed on the pan or in the oven or toaster. Tonight was a night of recuperating from the night before and a day of work (I work on Saturday) so I was in the mood for an easy dinner. That means not thinking and not shopping. I wanted to open the fridge, pull a few things out and dinner to appear! My daughter happened to be off at a party which only left three to cook for. Each evening I cook food that the whole family can eat. I don’t believe in “kid food” where the children are offered the boring version of pretty much everything…….fish becomes a frozen battered square which is fried, chicken turns into nuggets or patties, a baked pasta dish is watered down to an instant Mac & Cheese or a frozen pizza – I’m sorry, but this is disgusting food and should not be fed to your children! There is no argument in the world that could convince me otherwise. For example, it is just as easy to boil some pasta and while it is cooking, fry two eggs. When there are just cooked toss in some spinach, salt and pepper and top the cooked pasta with this and a little extra drizzle of oil – a completely balanced meal – protein, carbohydrates and greens! My children were not born ready to eat seafood and curries. They ate what was put in front of them and figured that this was what food was supposed to taste like. Of course there are plenty of things that I love that they still don’t like to eat but with a little thought I am able to cook food that satisfies all our palates. We each have our own favorites and I still have a hard time cooking a meal that gets the absolute thumbs up from everybody – but, they still eat it! 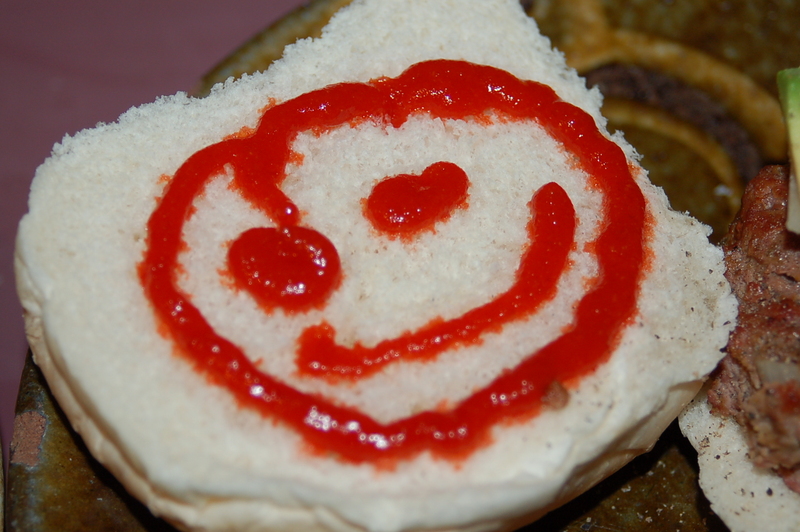 If you still think it is impossible for you to do this there are plenty of great companies making condiments and sauces that can flavor your basic ingredients. The Patak company for example has tons of great jarred sauces and spices that you can simple add to your fresh chicken breast or fish. In the time it takes to heat a frozen pizza you could have something more deserving of your family on the table. Teach your children how to be smart about food and not grow up thinking that driving your car to a window and being handing a bag of food, and eating it on the way home is the way one should eat their dinner or lunch? We live in a world where we have so much and then we go home to our family and feed them unhealthy, lack-lustre food. As we all know, good habits start young – start cooking and get rid of what you think is your only alternative because of your harried life – surly your family is worth the effort. Anyway…..what was I trying to say before I was compelled to speak out against crappy food? Ah, yes, I was saying that my daughter was away for the evening and I starting talking about cooking to please everyone etc……..well, sometimes I rebuke that idea and do what I did tonight. I was craving something spicy, spicier than my kids can handle (at the moment!) and figured I could fry some fish for my son and give him the same rice I was cooking, toss some greens into his rice and a little soy sauce, and with little effort his dinner could be ready. That is what I did! I had four chicken breasts that needed to be cooked and then I hunted around to find hot flavors. I find if I think of a country famous for it’s hot food it guides me to stay consistent with flavor combinations. I have a curry powder that I love which is distributed by the company House of Spices (India) Inc. called the Laxmi Brand and it is such a nice blend. You can buy it in 7 oz (200g) bags and is very inexpensive. This curry powder had all the trademark Indian spices like cumin, coriander, chilis and fenugreek so I just added more of the same to my sauce. Reading the ingredients on a bag of spices is very helpful if you want to learn flavor combinations from different countries. I sometimes look at different curry powder and chili blends in the supermarket or spice shop and if I have all the spices at home I just fudge a variation of my own. Tonight I used the curry powder to build my meal. I added some Thai chilis (tiny little peppers that come in green, yellow and red hues). I did not chop them because I knew they were hot little things and did not want to fully release the heat into the sauce. The curry turned out to be spicy, but not overly so, except if you took a bite of the chili in combination and then wow – extreme eye-watering, nose-dripping heat! Myself and my man Dave loved it. I also loved making something just for us. I had the best drink with my dinner which helped to diffuse the heat in a beautiful way – prosecco! (sparkling Italian wine). The chill in combination with the bubbles soothed my lips and tongue in preparation for the next bite. 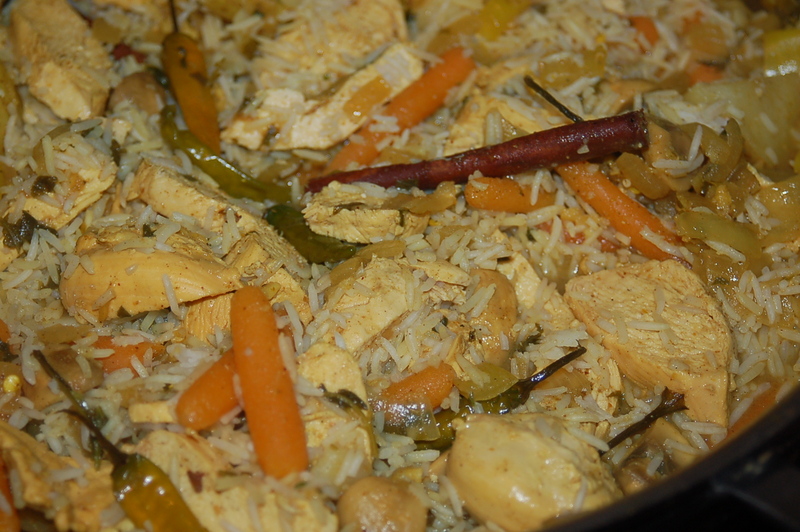 Of course you can also cook this without the peppers and it becomes a lovely curry for the whole family! 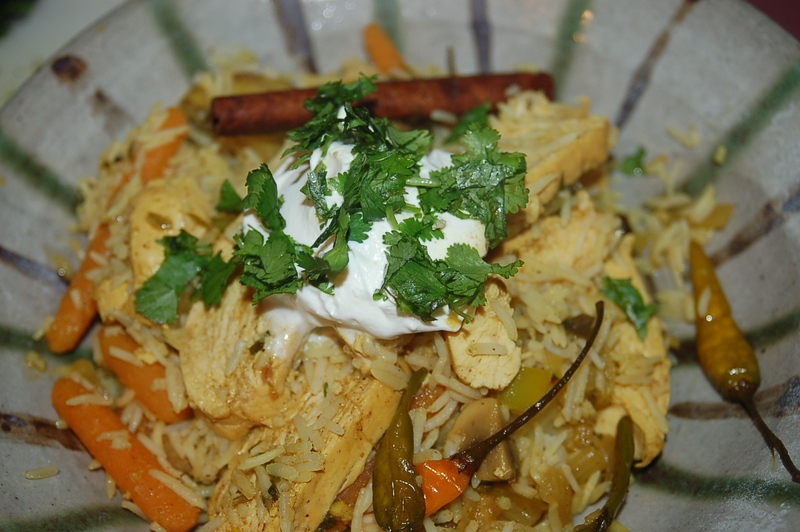 You will need: 4 boneless skinless chicken breasts, 1 sweet onion, 1 cup baby-cut carrots, 7 to 8 medium white mushrooms, 1 banana pepper, 10 Thai chilis, 4 cloves garlic, 1 tbs freshly grated ginger, 1 tsp coriander, 1 tsp cumin, 1 tbs curry powder (I used an Indian curry powder), 4 tbs fresh cilantro (more for garnishing), 2 cinnamon sticks, 2 tbs extra virgin olive oil, 4-6 cups freshly boiled basmati or jasmine rice. Put rice on to cook (boil on stove-top according to instructions or use a rice cooked) Dice onion, grate ginger, quarter mushrooms, squeeze lime, slice and chop banana pepper, chop cilantro. Turn heat to medium on stove-top and put oil in big saute pan. When oil has warmed add onion and garlic and saute for 3 or 4 minutes. Add mushrooms and carrots and continue to cook for another 3 minutes. Add banana pepper and chilies and cook for a further 2 minutes or so before adding all spices. Add broth and and spices.. 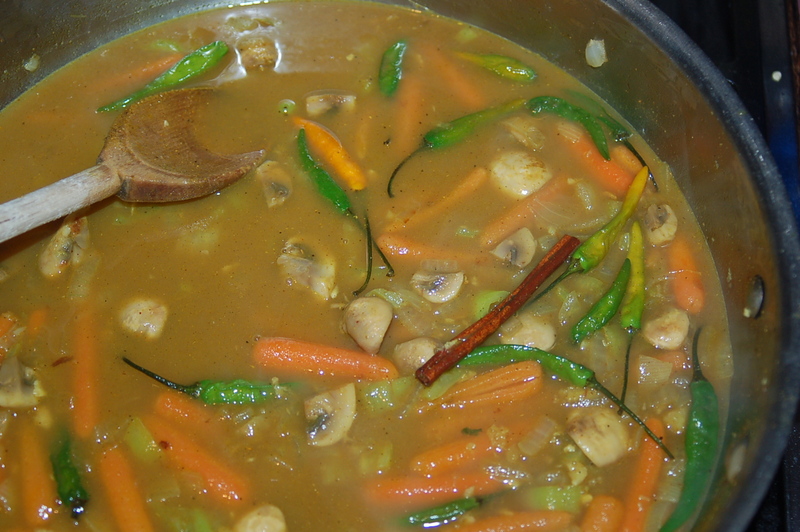 Mix spices into vegetables and cook for 1 minute before adding the broth and cinnamon sticks. Bring to a simmer and cover. add cilantro and lime juice when chicken has cooked..
Simmer gently for 3 minutes and then add the chicken breast and add up to 1 cup more broth if you want more liquid. Cover and continue to simmer until the chicken is tender (check after 15 minute, but should be certainly be cooked by 20 minutes). 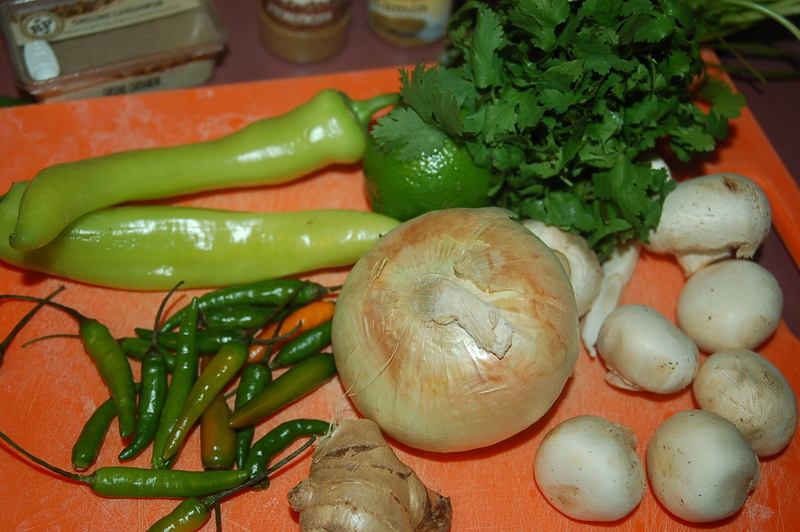 Take off heat and stir in the lime juice and cilantro and cover and let sit for 5 to ten minutes to let flavors meld. 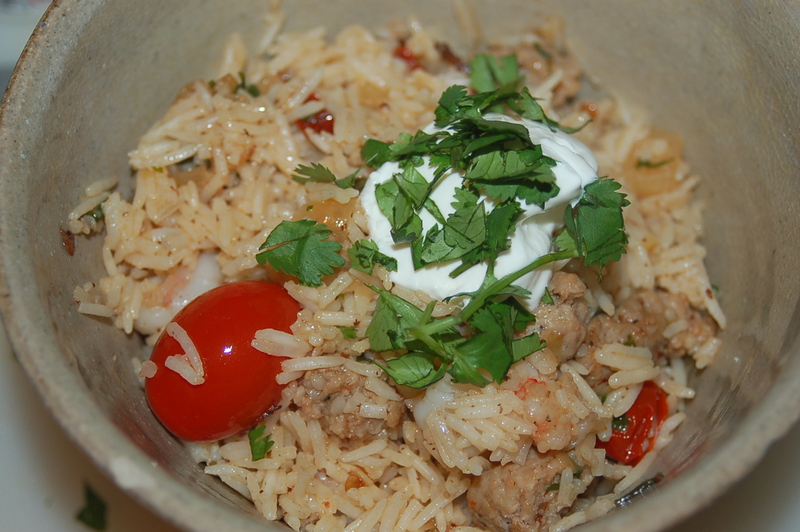 Serve with boiled rice, more cilantro and a dollop of sour cream (helps with cooling and adds a lovely fresh element). a little lemon juice on fish goes a long way.. I was going to call this dinner Alliteration Stew because of the ingredients: sole, shrimp and spinach stew – but how pretentious is that!!?? It was Friday evening and I invited 2 friends and their dogs to dinner. I love Friday nights…the beginning of the weekend and everyone is in the mood to relax and celebrate! We did just that. I decided to make something that was relatively untaxing so I could enjoy the company so, I went with a flavorful seafood dish. I had planned on having shrimp, a fish and some sort of bivalve (!) but when I was checking out at the supermarket I gave the mussels a whiff and they smelled me right back! They certainly did not smell mildly of ocean breezes and so I returned them, feeling a bit sad that they lived in vain. I hate when things get thrown away and wasted like that – pointless. So I made do with what I had and it turned out to be just right. 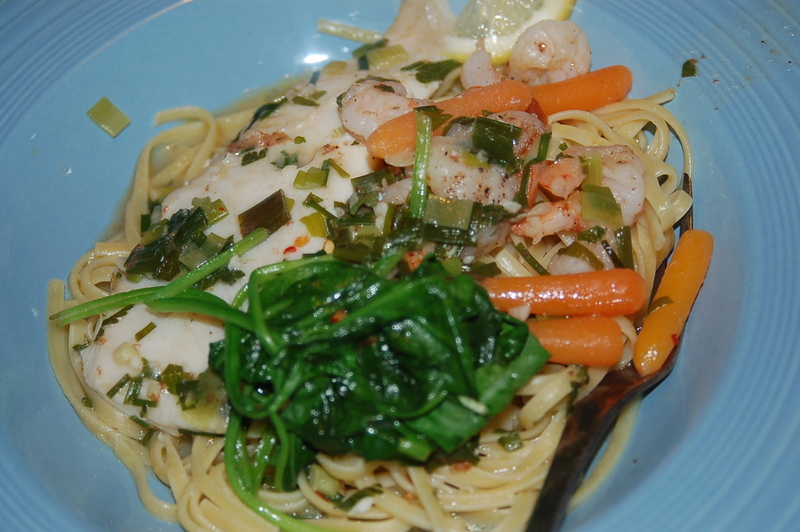 It was a heavenly dinner with silky sole and tender shrimp swimming in a herb-y sea-kissed broth with the mildest of a tang from the lemon juice and a hint of heat from the chili. By far one of my best efforts. 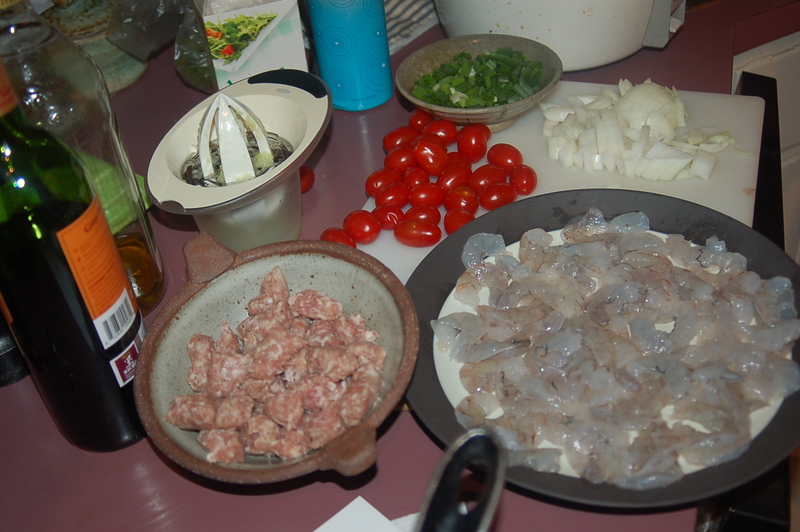 You will need: 1 lb shrimp (31-40 count), 1 1/2 lbs sole, 1/3 cup white wine, 1 1/2 to 2 cups chicken broth, 1 bunch scallions (6-8). 4 cloves garlic, 2 cups baby-cut carrots, 4 cups spinach (about 9 oz)2 tbs chives, 2 tbs flat-leaf parsley, 2 tbs unsalted butter, 2 tsp lemon juice, 1 tb olive oil, 1 tbs flour, 1/2 tsp chili flakes, salt & freshly ground black pepper. 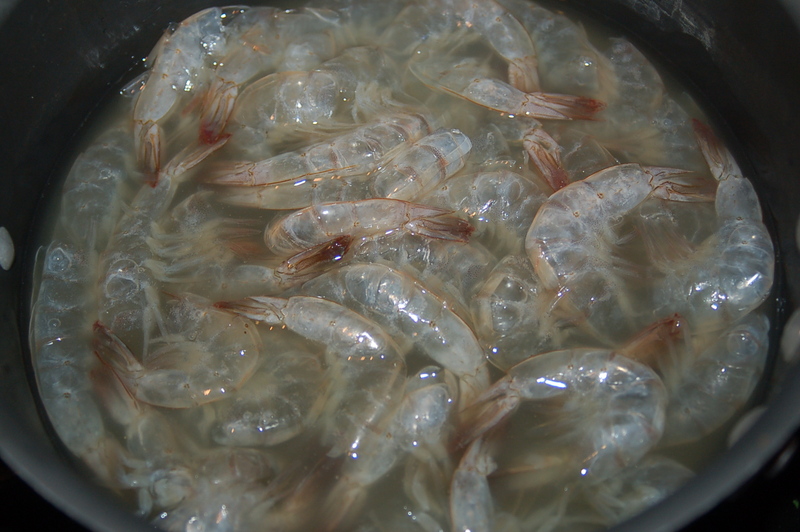 simmer shrimp shells with a little wine and chicken broth to intensify flavors..
Take shell off shrimp and put in pot with chicken broth and white wine. Bring liquid to a simmer and cook for 15 minutes. Turn off heat and set aside. 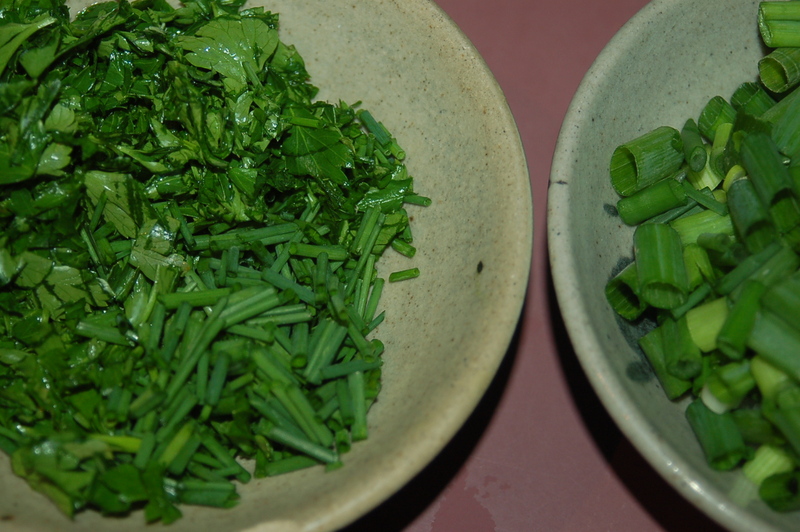 In the meantime prep all vegetables: chop parsley, chives, garlic. Wash and chop spinach. Put pot of water on to boil (about 2 cups) and when boiling cook carrots for 4 – 5 minutes until just tender. Drain in colander and set aside. Slice shrimp all the way down the middle into two pieces. Put big saute pan on medium heat and add oil. 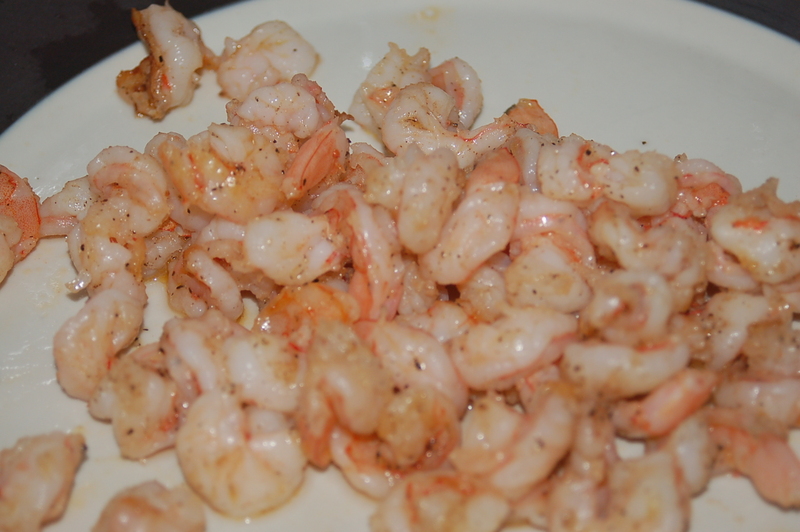 when oil is hot add shrimp and grind in a generous amount of black pepper. Leave to cook for 1 1/2 minutes and then stir. 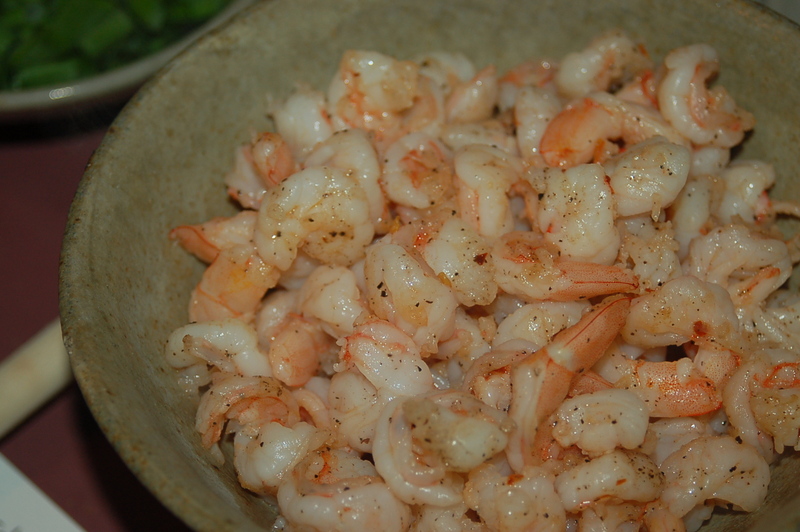 Cook for another 1 1/2 and remove shrimp to a small bowl and cover with foil until ready to serve. saute shrimp and set aside..
Add butter to the pan and when melted add the scallions and garlic. Saute for 3 minutes or so before adding the flour. Stir flour into mixture for 1 minute and slowly strain shrimp broth into pan, stirring constantly (I pour the liquid into a strainer which catches the shells). 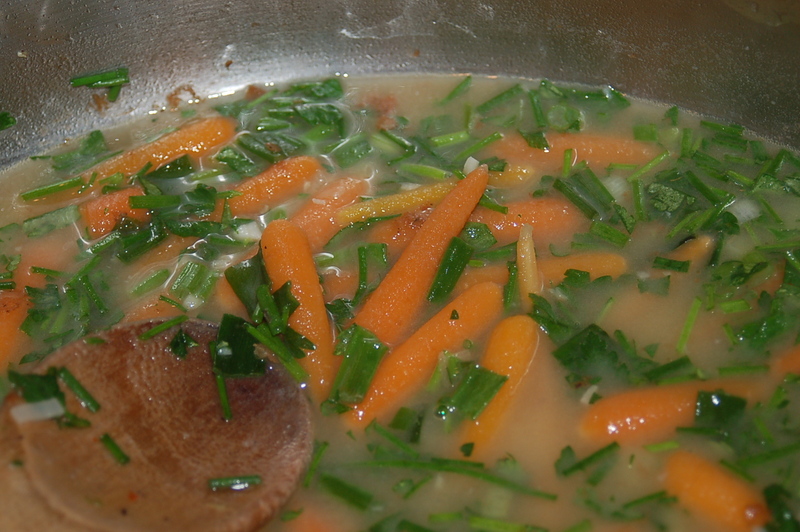 Add herbs, carrots, spinach and pepper flakes and let liquid come to a simmer. Taste the liquid at this point to see if it needs salt. When simmering cook for 3 or 4 minutes. simmer for 4 minutes before adding sole fish..
Add the sole (you can slice down the length of the fish into two pieces). 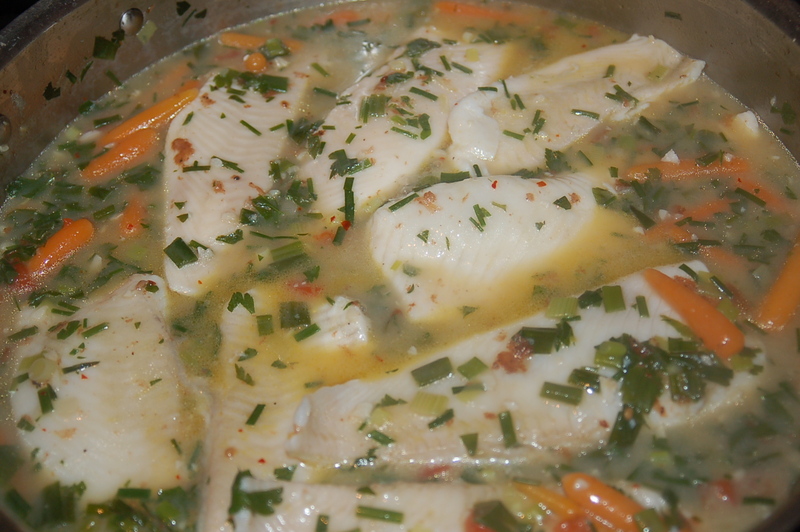 Poach fish in liquid for 4 minutes after it has come back to a simmer (with lid on). 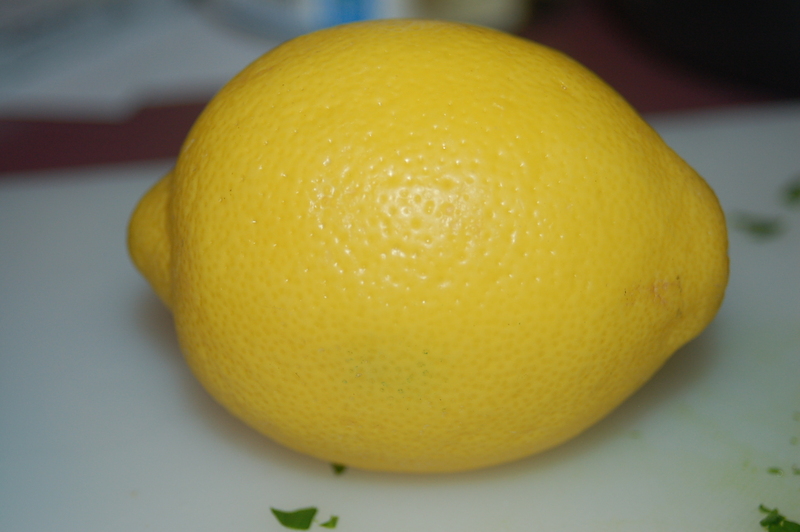 Turn off pan and swirl in lemon juice. Right before serving toss shrimp into the stew. add fish and simmer gently for 4 to 5 minutes.. Serve in shallow bowls with linguine, an extra sprinkle of chives and a slice of lemon. 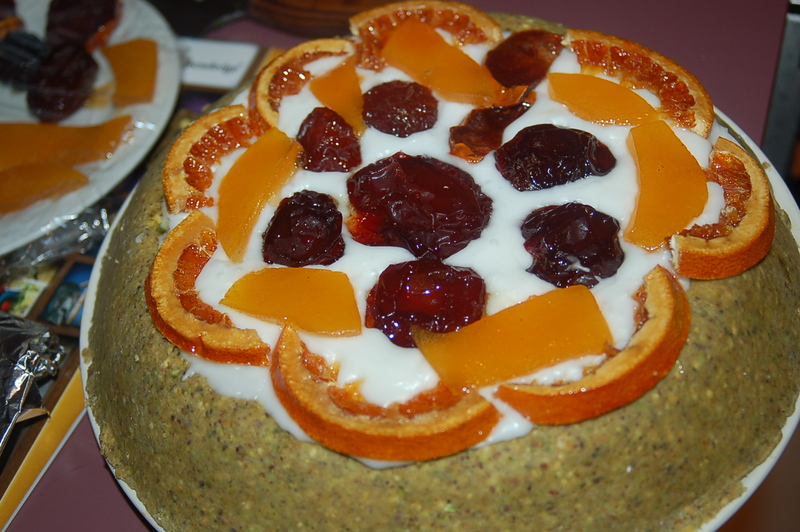 This was one of my favorite dinners to date..
For dessert our friend Tom brought a traditional Sicilian Cake - Cassata, which is a ricotta cake with a pistachio marzipan crust - this was so over-the-top good! Yesterday was my Mother’s Birthday and I made this dinner in her memory. I wanted it to be something she would love or something she cooked. I managed to do a bit of both. My dinner last night was so personal to me. I wanted to please and honor my Mother’s life through food but I did not want the gesture to be artificial….. like, when someone important is coming to dinner and you need to impress them….you make the mistake of cooking something you have never tried before and you find yourself in an uncomfortable kitchen, where things go wrong and you don’t recognize your food? At this point in my life I have accepted what I can do and just concentrated on making the best I could. So many days growing up I would sit at our table in out dining room at my spot ( we all had our own seat with our invisible names embossed on our chairs). It was a cardinal sin to sit in someone else’s place. My mother had some signature dishes and, being her child I took her food for granted…..her brown gravy, her white sauce, her bread stuffing, her floury potatoes, her melt-in-your-mouth stew….the list goes on. She had a robust dinner on the table in the blink of an eye, and this happened every single day. I entered adulthood thinking you could magically cook dinner for 8 in under an hour – no problem. That, I have discovered, is not the case. It takes guts and love to put something on the table in that time. My mother did not ponder over ingredients and peruse cookbooks, there was no time! She just hit the ground running, and through the sheer act of cooking dinner, day in, day out, she perfected the art of turning out delicious meals that I, and the rest of my family long for to this very day. How sorry I am for not asking the particulars of a dish? Although, she would have been no help in recounting the method…..I would have had to have been standing there with a video recorder! She performed her tasks so naturally, and so fast it would have been difficult for her to stop to explain what she was doing. I now appreciate her efforts to please people. She wanted to fill bellies and send everyone to bed or home, satisfied. That was a great objective, and I wish she was here tonight willing me on. I wanted to make the ubiquitous Irish staple of Bacon and Cabbage with Parsley Sauce but my less than adequate supermarket did not have ham!! Or should I say, yes, there was ham, but it was all precooked! I wanted to boil it myself and happily skim the scum off the surface, but, I had to settle for pork chops which I decided to wrap in bacon to give it a “hammy” flavor? It was a very simple dinner to prepare but the results were sumptuous and comforting all at the same time. We sat around the dining room table telling stories about my mother and feeling closer to her with every familiar mouthful! she would have loved the pork chop idea and praised me to no end for being so clever…as only a mother could. You will need: 6 good-sized pork chops (bone-in), 2 – 3 lbs potatoes, 1 head savoy cabbage (2 lbs), 3/4 lb bacon strips, 2 1/2 cups milk, 5 tbs unsalted butter, 3 tbs flour, 4 tbs chopped fresh parsley, 1/2 tsp kosher, 1/2 tsp freshly ground black pepper, more pepper and salt to taste. 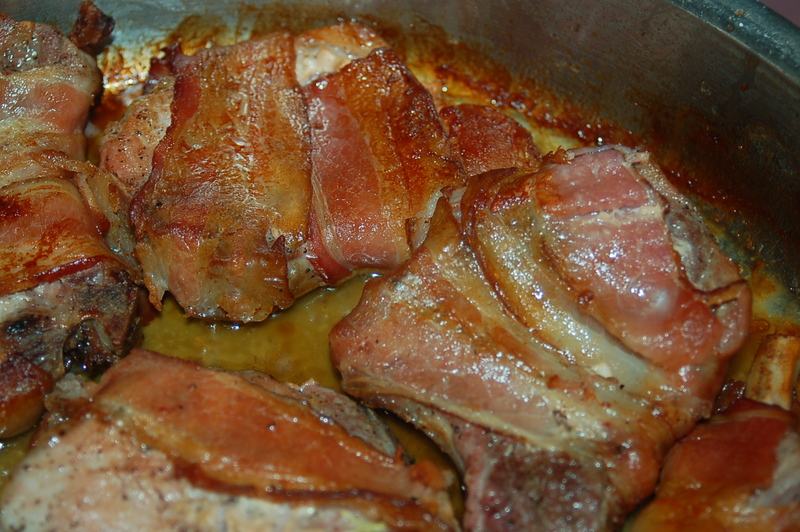 Season chops with black pepper and wrap each chop with 1 or 2 strips of bacon and place in saute pan. A snug fit is best. Place in preheated oven and time for 20 minutes. While chops are cooking wash and slice potatoes in half, put in pot and cover with cold water and boil with lid on until cooked (a knife should be able to go through the potato easily). Drain and add 1 tbs of butter and a sprinkle of pepper and salt. Cover with a tea towel and leave on stove-top until ready to serve. Also, slice cabbage into four pieces and then cut out central core and discard. 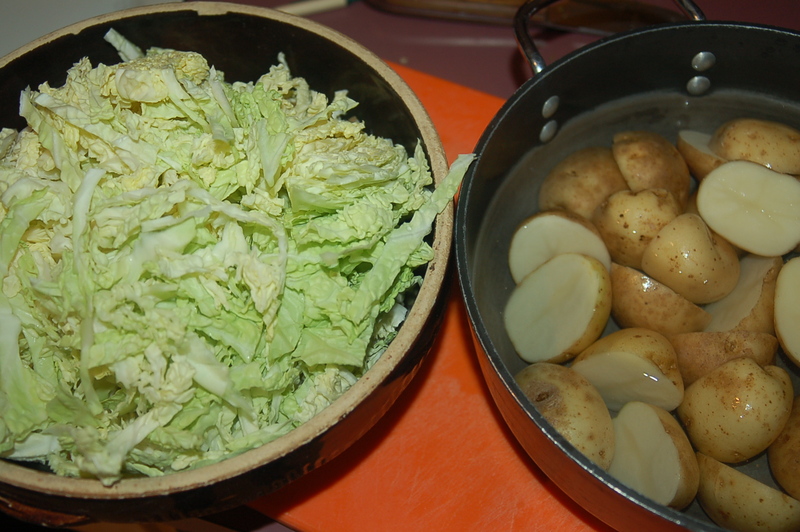 Slice cabbage and put in pot and add cold water – enough to come half-way up the cabbage. Cover and boil until very tender (20-25 minutes) Drain and add 1 tbs butter and a little pepper. When the chops have cooked for 20 minutes, turn the heat down to 400* and turn chops in pan. Cook for another 15 or so minutes. 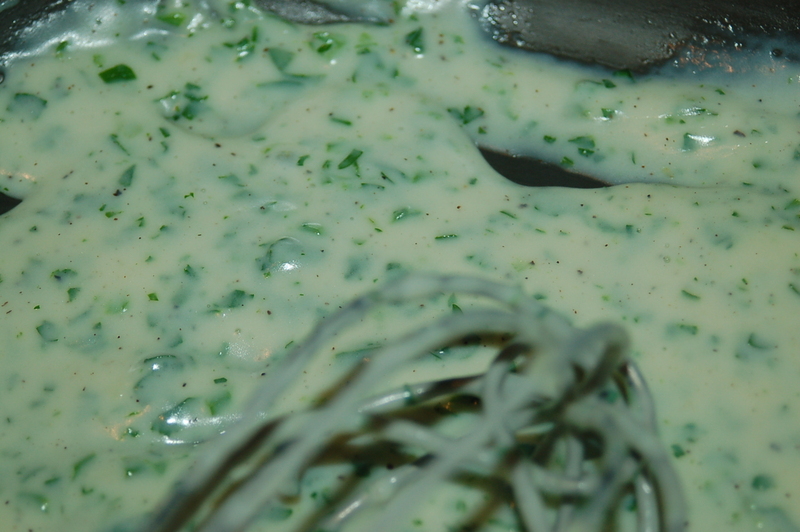 While chops are cooking make parsley sauce: Put pan on low to medium and melt 3 tbs butter. When melted add flour and whisk until smooth paste has formed. Turn heat up to medium and add milk slowly. you can serve parsley sauce with any number of dishes - lovely on trout! When milk is hot (simmering) turn heat down to low, add 1/2 tsp salt and some pepper and cook whisking occasionally for 15 minutes. Add parsley and stir. At this point the rest of the food should be ready. 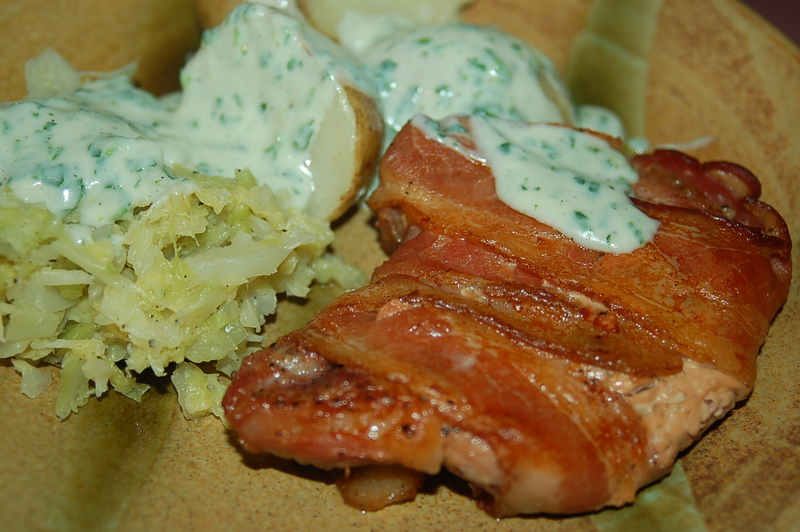 Put chop on plate with some potatoes and cabbage and spoon parsley sauce over potatoes and a little over cabbage. Also drizzle a little of the pan dripping from the cop onto the meat. 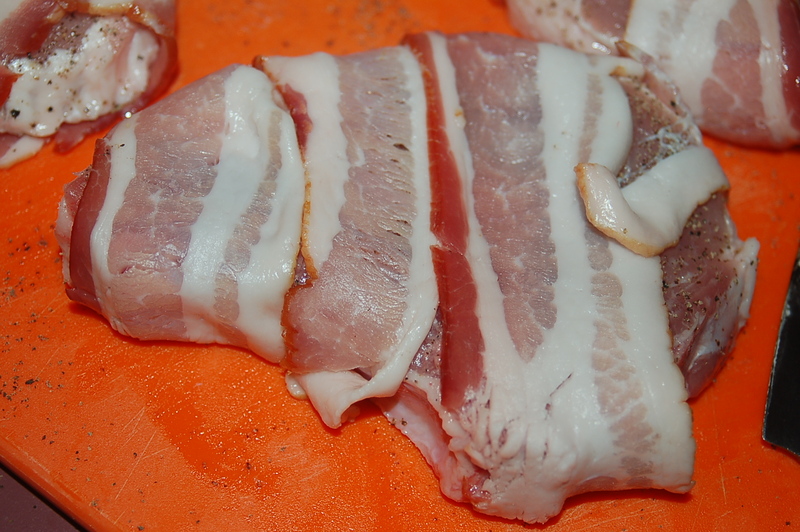 Note: if you want the bacon on the chops to be more crispy, when cooked, broil chops for about 3 minutes or until bacon looks crispy. Who hasn’t sung the praises of this delectable chocolate spread? I need to officially sing it’s praises also. As well as the cocoa powder, which gives Nutella it’s chocolaty color and flavor, it boasts that it is made with over 100 hazelnuts per jar, and I believe them! When I was visiting France with my friend (oh so many many years ago) we were touring around on less than a shoestring budget. We had grossly miscalculated how much trains and youth hostels would cost so we had to be very careful about not spending too much money on food. 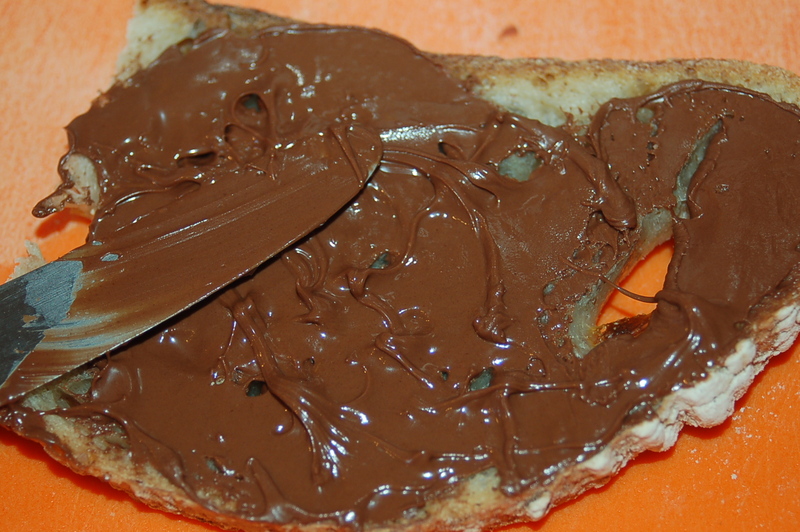 I remember two things we could afford – canned pate and Nutella! The pate made us feel like we had dinner and the Nutella made us feel rich. We carried a jar of it in our backpack and scooped it out with our fingers whenever we needed some sustenance! 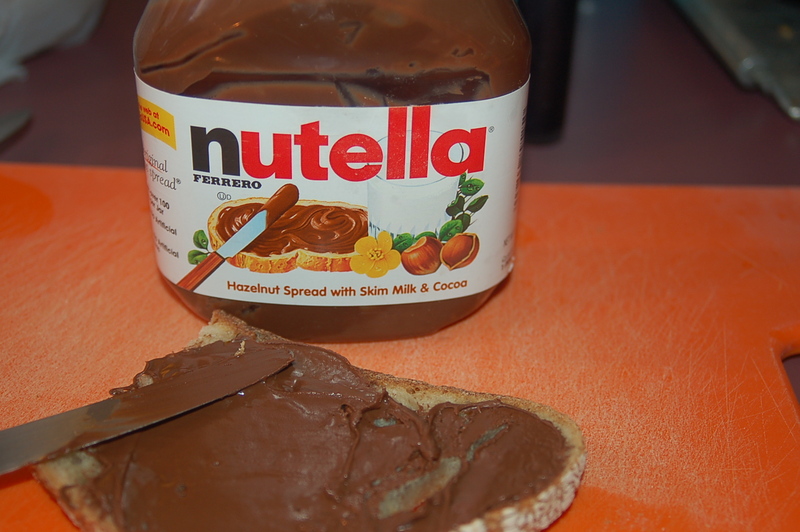 I will always remember Nutella as the chocolate hazelnut spread that kept me alive! Today, it is a staple in our house, and though it can be used in many ways we like it on toasted crusty white bread or fresh scones any time of the day or night. My husband came up with the name. Since starting this blog I have to come up with titles for my dinners. Each evening while we are eating I ask “what should this be?” I always struggle with this because I want to list all the ingredients, like………chicken with onions, thyme, garlic, carrots, & white wine – or in tonight’s case, shrimp and polish sausage with sweet onions, lime juice, cherry tomatoes in broth and, a chipotle pepper – much too complicated! While eating, my husband said it tasted sort of Mexican. I told him I used a little chipotle pepper, lime juice and cilantro and then, his response made sense to me. I feel sort of silly calling it this or, calling something “Chinese chicken” or “Oriental Pie” since I have never even been to the places I am referring to. I go ahead and just presume I know the food because I read cookbooks and try to eat in ethnic restaurants in big cities? Anyway, I think when you give a recipe a title it either draws you in or repels you. I hate a title for a dish to be so subjective as to put someone off from trying something, and now, here I go and suggest, because my food is somewhat spicy it hails from Mexico! I am quite sure that no such dish has ever been cooked there but I am leaving the title and hoping that everyone gets the general point of the name? The food was good and I had no complaints, save for a little one from my daughter who found it to be a little spicy. I only took the liberty of using 1 tiny chipotle pepper and, it just so happened it was a hot one! You can never tell if a pepper is hot or mild just by looking at it. You have to taste it. I always think twice before adding something hot in consideration for those palates who have a hard time handling the heat. I usually touch the pepper to my tongue but tonight I took a chance. It was just one measly pepper – how hot could it be? Lesson learned. 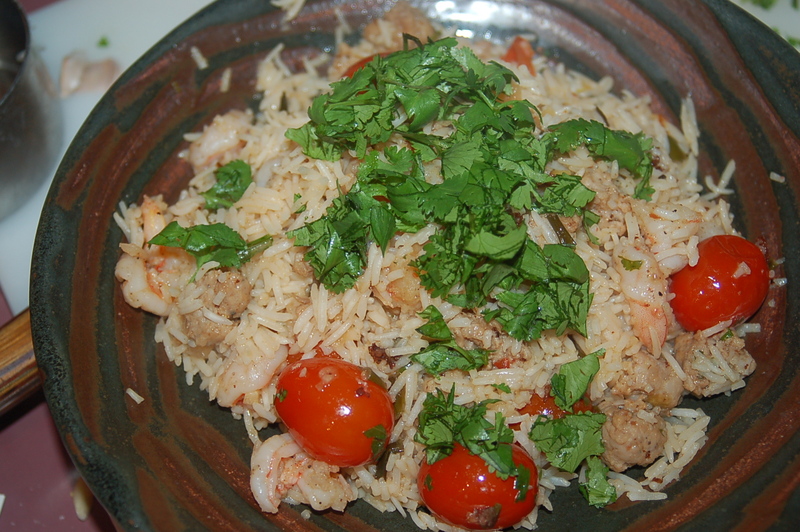 You will need: 1 lb shrimp (31-40 count per lb size), 1/2 lb Polish sausage, 6 scallions (green onions), 1 medium sweet onion, 1 dry pint cherry tomatoes, 2 cloves garlic, juice of 1 lime, 4 tbs chopped cilantro, 1 chipotle pepper, 2 1/2 cups chicken broth, 4 tbs extra virgin olive oil, salt and freshly ground black pepper for seasoning, 2 cups uncooked Basmati rice. Prep everything: Dice onions, slice scallions, finely chop garlic, take sausage out of casing and slice into 1/4″ chunks, take shells from shrimp and slice entirely up the middle into 2 pieces, squeeze lime, chop cilantro and put rice on to cook – cook according to instructions if using a pot or, use a rice cooker. Put big saute pan on medium heat and add 2 tbs of oil. Let the oil warm up, season shrimp with a sprinkle of kosher salt and freshly ground black pepper and cook on pan for no more than 3 1/2 minutes. Set shrimp aside until the end.. Transfer to bowl and set aside. 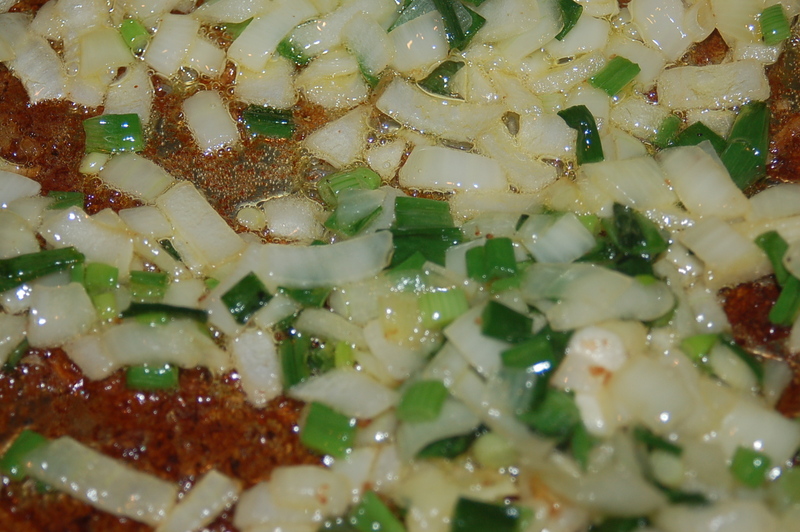 Add the rest of the oil and add the scallions and onion and saute for 3 minutes. Add the garlic and sausage and cook for about 4 to 5 minutes. Add cherry tomatoes and chipotle pepper and cook for another 2 minutes before adding the broth. 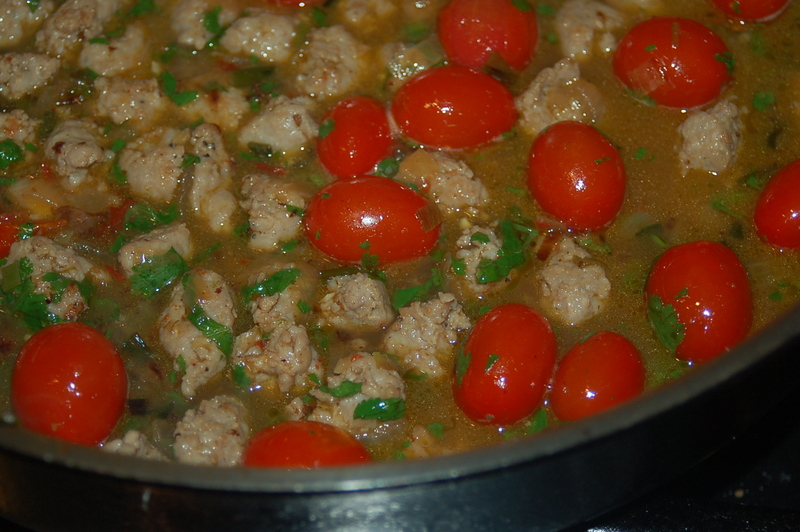 add sausage, then tomatoes and chipotle pepper..
Let it come to a simmer and cook for another 3 minutes. Add the cilantro and lime juice, stir and cook for 1 minuter further. Add broth, cilantro and lime juice.. Turn off heat and add the shrimp. Taste and season if necessary. Add rice (about 5 cups of cooked rice) and serve immediately. Serve plain with a sprinkle of cilantro or with a dollop of sour cream and hot sauce. Tonight’s dinner was a bit of a challenge because when I stood in my kitchen I had no clue what to make. I had gone to my very favorite supermarket on Monday and had lots of things in the fridge just waiting for me to get my hands on them. It was very confusing when I started pulling stuff out to see what I wanted to prepare. 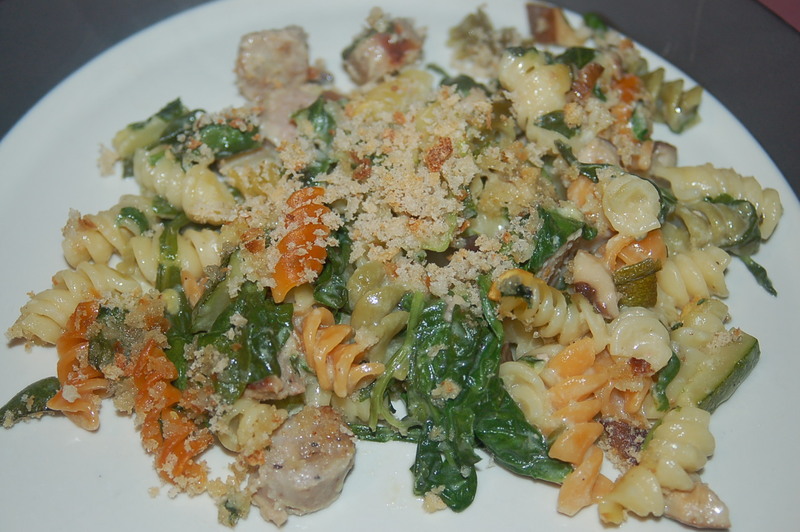 I was longing to do something with the arugula…..and I had 2 little black trumpet mushrooms……..great looking zuccini……..sweet onions….bunches of herbs…..not to mention 3 different kinds of sausage. When my food really fails is when I use too many ingredients, and I was in great danger of doing just that this evening! I settled on the sausage and then I got lasagna stuck in my head. I did not have any lasagna noodles so I though I could use the lasagna idea as inspiration for a different kind of baked pasta dish? I settled on the seasoned sausage and the pasta available to me was tri-color rotini. I also bought 3 very big bunches of the freshest spinach and knew I would have to use one tonight or I would end up in trouble later in the week. I thought I would make something like a vegetable lasagna only use a different kind of pasta and add sausage! It turned out terrific I have to say. My son is not fond of pasta and creamy things and when he saw the pan coming out of the oven he asked if there was a back-up in case he disliked it. I assured him he would love it and for once I was right. His plate came back clean and he commented on how the sauce was barely noticeable. I try to ignore my children’s likes and dislikes which has really helped in expanding their palates. They certainly have their favorites, but they are pretty willing to try most anything. It was a good night in the kitchen and I sit here quite content with myself. You will need: 1 lb apple and onion seasoned sausage (that is what I used and it was really good so, I would recommend a seasoned sausage of some kind – garlic and herbs, white wine and onion….there are lots of choices available out there in good supermarkets), 1/2 lb shiitake mushrooms, 2 medium zucchini (courgette), 1 huge bunch of fresh spinach (about 1/2 to 3/4 lbs), 2 sprigs fresh thyme, 1 lb tri-color rotini (plain is fine or penne), 2 1/4 cups milk (whole or 2%), 5 tbs unsalted butter, 4 tbs unbleached white flour, 1 cup bread crumbs, salt and freshly ground pepper. If your sausage is in a single rope (like mine)…cut it into about 8 pieces and cook on low to medium heat (cover with lid) turning once until cooked (15-20 minutes). saute on pan - no need to add oil.. 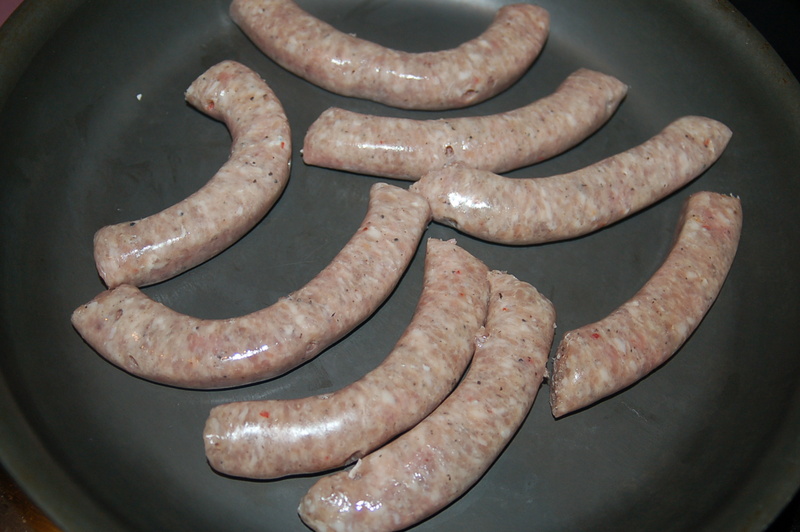 When cooked slice sausage into 1/2″ pieces, turn pan off and set aside. 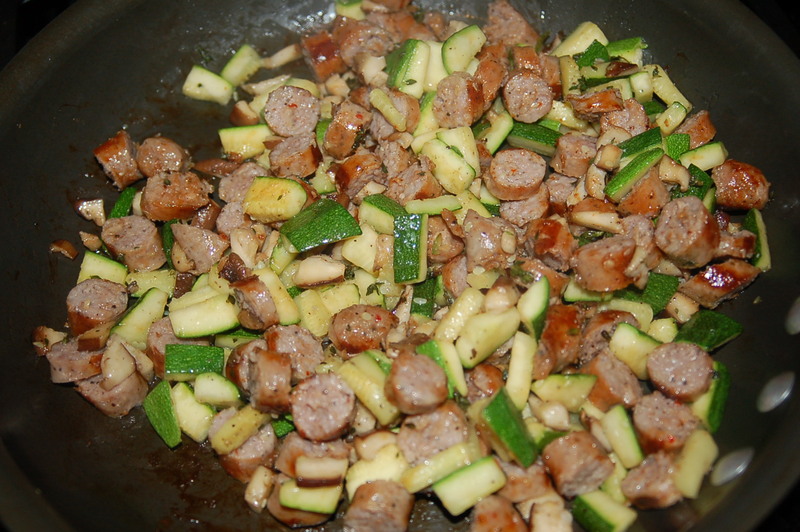 While sausage is cooking dice mushrooms, slice zucchini into 1/8 ” coins and take leaves off thyme (do this by holding the top of the stem and running your fingers backwards down the stem – the leave will drop off) and saute in big saute pan with 1 tbs butter and 1 tbs olive oil until soft (about 15 minutes). 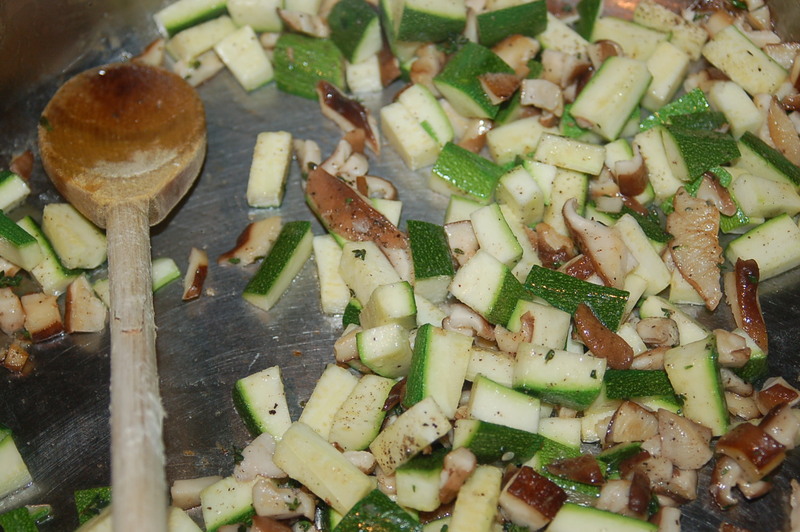 saute mushrooms, thyme & zucchini until soft.. When cooked scrape vegetables into pan with sausages and re-cover with lid. At this point put on pot of water to boil and cook pasta according to instructions. Reserve 1/2 cup of pasta water before draining for use in the sauce if needed. In big pan add 4 tbs butter and melt on low heat. 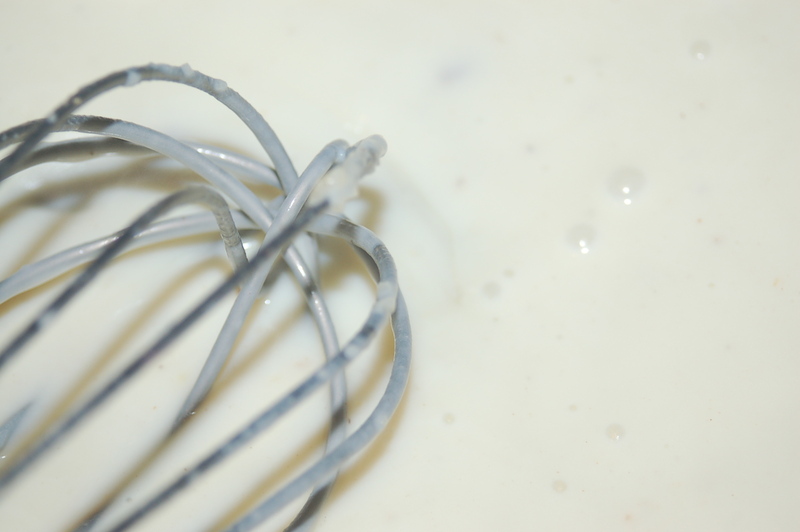 When melted add flour and swirl with a whisk into a smooth paste. Add 1 cup of milk and whisk until smooth. Keep adding the milk and cook for about 15 minutes, whisking frequently (until the flour is fully cooked into the sauce). Season with 1/2 tsp freshly ground black pepper. 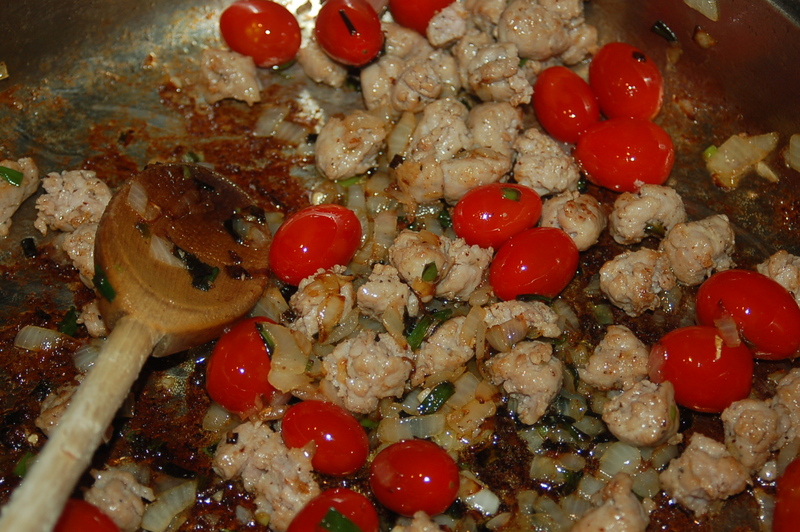 Add vegetable and sausage mixture to sauce and stir. At this point taste sauce and add salt if you think it needs it. I don’t add salt until the sausage is added to the sauce in case the sauce turns out to have enough salt to flavor the sauce? 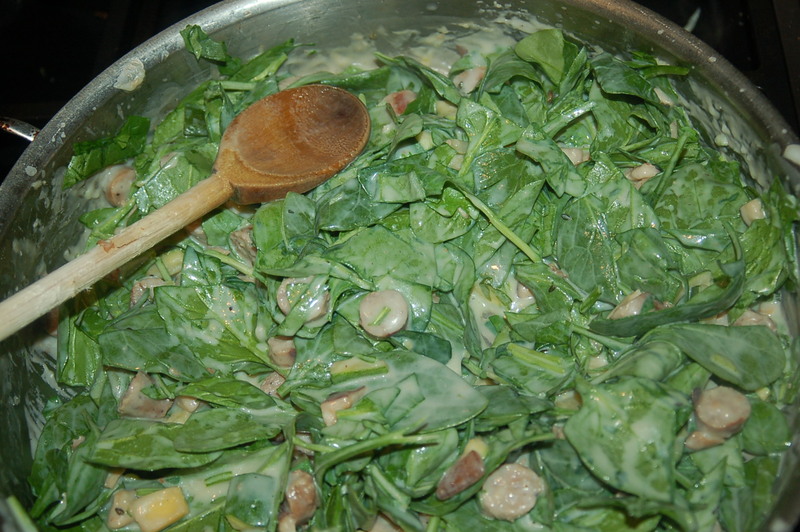 add chopped spinach to sauce and stir..
Wash spinach and chop very well. Add to pan and mix into sauce until well incorporated. Add cooked pasta and pasta water and mix into sauce. Leave in saute pan if it is oven-proof and sprinkle bread crumbs on top (I put two pieces of good bread in my food processor and made the crumbs). If not, transfer to casserole and go from there. Place in oven and bake for 20 minutes. 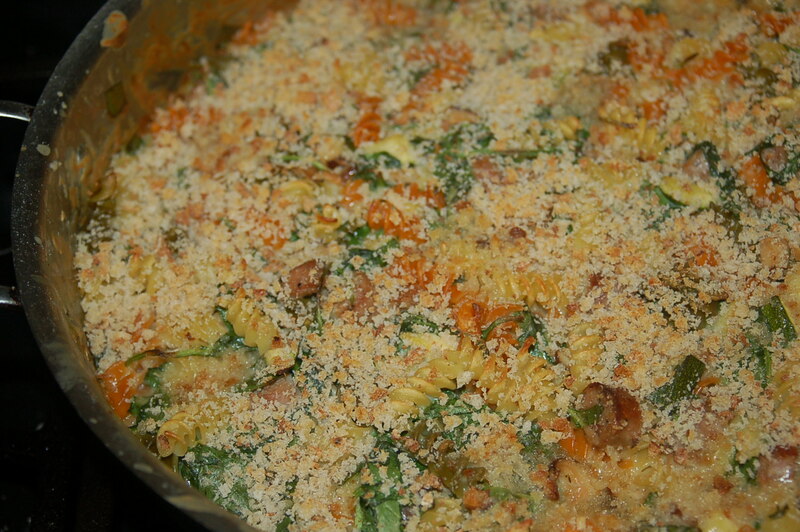 Bake in oven for 20 minutes..
Let pasta rest for 5 minutes before serving in warmed shallow bowls. Sprinkle with Parmigiano Reggiano if desired.